Six years after their debut record, and three years after their sophomore effort, Halestorm released their third album “Into the Wild Life” Tuesday. The group, which features siblings Lzzy Hale on vocals, her brother Arejay on drums, Josh Smith on bass and Joe Hottinger on lead guitar, has been busy touring – they spent most of 2014 touring with Eric Church and are about to embark on the Carnival of Madness tour with Pretty Reckless, but the group took time out of their busy schedule to break away from their norm and release their third LP. I’ve never truly bought into Halestorm, always seeing them as a radio-rock band. I was pleasantly surprised seeing them live at the Missouri State Fair last summer, and they gave us a preview of what was in store for the new album when they played the heavy hitting “Mayhem” as part of the show. Even then I noted “It was good, with a cascading style that seemed to be a maturing sound for the band.” So I’ve been looking forward to this effort from the group since last August. The album kicks off with “Scream,” a fist-pumping power ballad that is more of Halestorm’s trademark. The droning guitar opens the door to the rest of the album, and there is a definite electro feel to the song, but it feels like one of the group’s songs. The last minute or so is all instrumental as the it segues into the second track, “I Am The Fire.” An angsty song about overcoming self-doubt, the song is definitely one that Halestorm fans can identify with. Hottinger’s guitar work really shines in the song, along with Lzzy belting the vocals. “Sick Individual” is another power ballad that feels like it could fit beside “Love Bites” and “Freak Like Me” on the sophomore album “The Strange Case Of…” The song is about being ok with who you are with both good and bad qualities, sort of an inner yin-yang. The guitar work is on point, with Hottinger again bringing the rain. 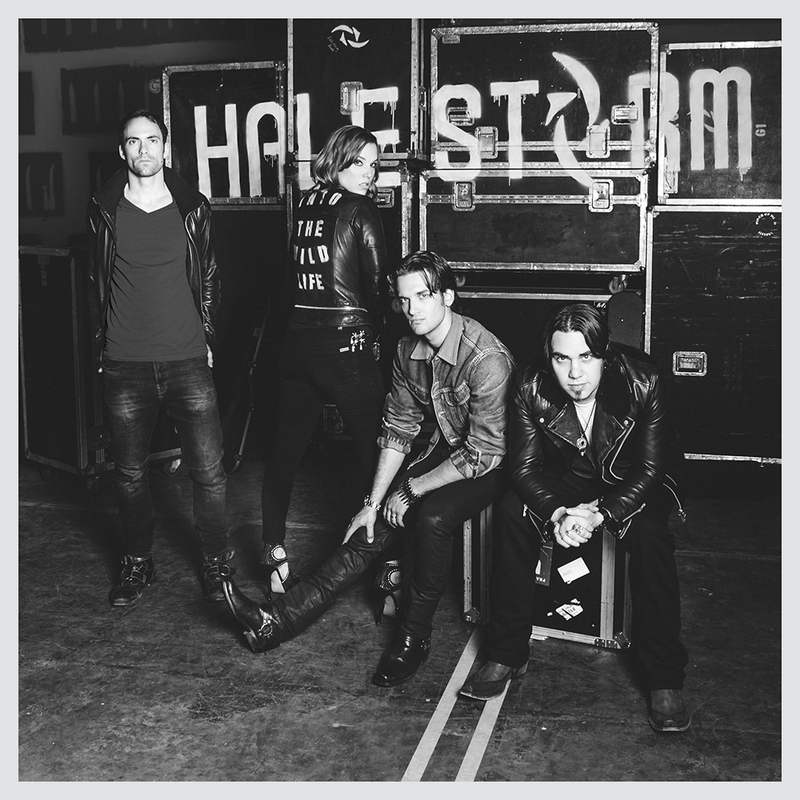 The song that really brings the album out of the typical Halestorm box is “Amen.” The song feels like a gospel anthem, with the country influence really coming through. The song is fairly sexual, but the heavy drumwork comes through in what feels like a contemporary version of “Cherry Pie” by Warrant. The second single off the album, the song appeals to a wider ranging audience than any other on the LP. The next song offers a bit of hope to young women. The slowed down ballad, “Dear Daughter” is a piano-heavy song that delivers a message that every girl should hold her head high despite life’s obsticles. The groovy “New Modern Love” brings the album back to life with a more atmospheric jam. There is some acoustic guitar work coupled with Smith’s bass setting the tempo. The song centers on being yourself and not letting haters bring you down. “Mayhem” is hands down the anchor of the album. I may be a bit biased since I saw the track live, but Arejay’s drum work really shines and fans will breathe a sigh of relieve with the heavy track. The song is about living, and embracing the mayhem that is life. Through the rest of the album, the blues-heavy tracks “Bad Girl’s World” and “The Reckoning” slow the pace and Lzzy’s mournful vocals really shine. “Gonna Get Mine” is another ballad that will probably end up in radio rotation, another song that focuses on being yourself no matter what people are saying or thinking about you. The first single off the album, “Apocalyptic” stays true to the traditional Halestorm power ballad. It picks up the pace a bit compared to the other five or songs on the back end of the album, with Arejay’s drumwork and Hottinger’s guitar giving the song the touch it needed to get fans excited for the album. The closing track, “I Like It Heavy” again picks up the pace and really shows the confidence the group has. It has elements that show multiple influences, vocally it seems like a country track but the guitar work moves from blues to hard rock seamlessly. “Into the Wild Life” is the best Halestorm album to date. The group stays true to their sound with their third effort but are moving forward and evolving their sound, unlike many of their contemporaries in the hard rock genre. The album is worth the pick-up to fans and those interested. The group definitely expanded their boundaries touring with Eric Church and the influences have helped them make a more complete album. While it sticks to the band’s traditional ballad structure, the album offers multiple changes of pace to keep listeners interested. I would have liked to hear some heavier tracks that really display the skills of the band, but the album holds its own.